Liberal Varsity Golf finished its regular season with a solid performance at the Liberal Country Club. Alex Carrasco tied for 10th place on the day with an 86 and Cameron Riley placed 3rd with a 77. The Redskins also placed 3rd as a team on the day. The tournament was won by Tradgon McCrae of Hays with a 76 and the team title went to Garden City. WAC awards were also given at this tournament. WAC Golf awards are based on a round-robin style tournament with every WAC Course tournament counting towards the season results. Two Liberal players received WAC recognition today. 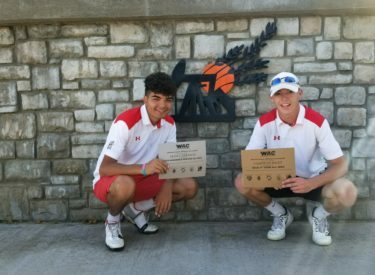 Alex Carrasco earned All WAC Honorable Mention and Cameron Riley earned 2nd place in the WAC. The WAC team title went to Hays as did the WAC player of the year–Tradgon McCrae. The Redskins finished 3rd in the WAC as a team. Play continues for Liberal with the regional Monday at Willow Tree in Liberal.